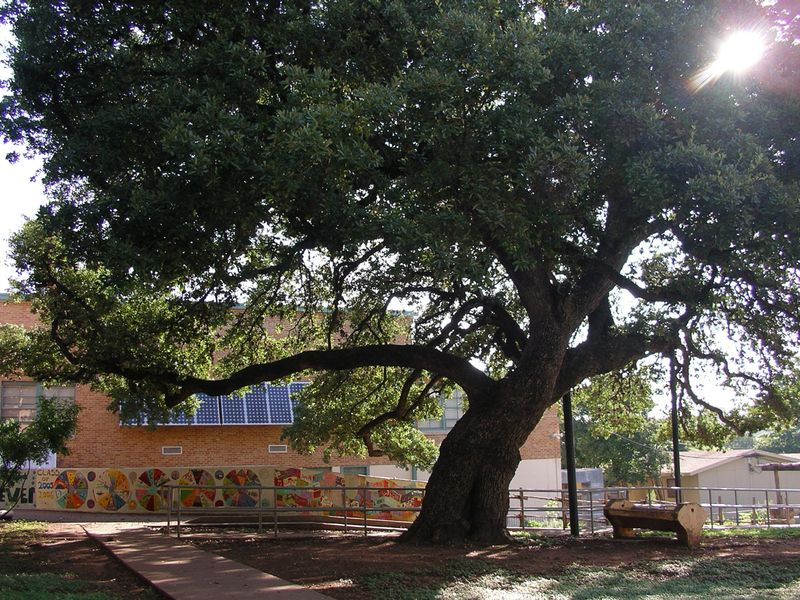 Although not receiving the City of Austin’s Tree of the year award, the grand Live Oak tree located directly behind Bryker Woods Elementary School is certainly worthy of recognition. Next time you visit the Elementary School, take a look at this magnificent tree, perhaps one of the oldest residents of our neighborhood. Listed in 1976 as a City of Austin “Heritage Tree” with at that time a canopy height of approximately 28’ and trunk circumference of 13’5”. The Live Oak is in excellent condition and has been well cared for by both Bryker Woods Elementary School and AISD; at one point a giant steel post was installed to support the tree’s massive leaning trunk. This Live Oak is old enough to have provided shade to native Americans and early settlers residing along the banks of Shoal Creek which runs behind the school. Currently the tree’s grand canopy provides shade for the children and staff at Bryker Woods Elementary. Under the tree is an old schoolyard concrete water fountain and next to the tree is an array of solar panels, a rain water cistern and the school’s organic garden. Having seen much change, this mighty oak tree symbolizes the resilience, gracefulness, tolerance and generosity for which Austin is well known.